With Alabama QB Tua Tagovailoa and Oklahoma receiver Marquise Brown each a self-proclaimed less than 100 percent healthy, the total for Saturday's Orange Bowl hasn't increased since sharp bettors took the UNDER last week. With Alabama QB Tua Tagovailoa (ankle) and Oklahoma receiver Marquise Brown (foot) each a self-proclaimed less than 100 percent healthy, the total for Saturday's Orange Bowl hasn't increased since sharp bettors in Las Vegas took the UNDER last week. Wiseguys at the Westgate LV SuperBook bet UNDER 80 points on Dec. 20, dropping the total to 77.5 where it has remained as of Thursday's writing. "Their goal in life is to bet every big total UNDER," Westgate oddsmaker Ed Salmons told BetChicago of the sharp action he's seen. "That’s just what they do." The UNDER has only hit twice in Sooners games this season as its poor defense relies on Heisman Trophy winning QB Kyler Murray (who is battling an [unknown illness](https://www.kjrh.com/sports/sooners-kyler-murray-still-fighting-illness-will-play-saturday)) and Co. to win games for them. 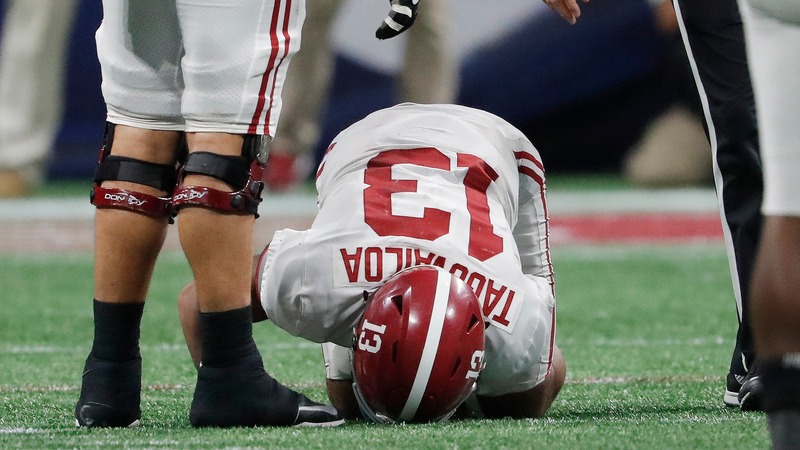 Against 14-point favorite Alabama things won't be so easy, but with Tagovailoa off ankle surgery and left guard Deonte Brown suspended, the offense may run at a slower pace as the Tide look to keep Murray off the field. <a href="https://twitter.com/MarkWood14/status/1077953995732328448" class="embedly-card" data-card-width="100%" data-card-controls="0">Embedded content: https://twitter.com/MarkWood14/status/1077953995732328448</a> __$5,000 up for grabs:__ [Free-to-enter five-day pick 'em contest](https://betchicago.chalkline.com/games/five-days-of-football-for-5k) Oklahoma's No. 1 offense should be able to trade punches early with the Tide, but for how long remains a big question. Brown leads the Sooners with 1,318 receiving yards and 10 touchdowns and the Tide allowed Georgia QB Jake Fromm to throw to 301 yards in an SEC Championship game they easily could have lost. While Alabama's defense ranks out as one of the best, it has struggled with explosiveness at times and ranks 46th and 35th in defending rush and pass explosiveness, respectively. With the Tide ranking first nationally in sack rate and the Sooners marginal at defending it, Murray should be on the run often on Saturday. Expect the Tide to send the Heisman Trophy winner a stern message that Tagovailoa, not Murray should have won the award. Betting trends aren't on Murray's side, either. Since 1980, players coming off winning the Heisman Trophy are 0-7 straight up and ATS. __MORE:__ [College Football Playoff odds and props](https://www.betchicago.com/cfp-odds-props-notre-dame-clemson-alabama-oklahoma) # 2018 college football bowl game odds ## Orange Bowl betting lines, odds and prediction Saturday, Dec. 29 at 7 p.m. CT on ESPN from Hard Rock Stadium in Miami ### Alabama vs. Oklahoma __Point spread:__ Alabama -14 __Total:__ 77.5 __Betting line movement and games notes:__ Alabama opened as a 14-point favorite and Salmons mentioned the Westgate is wary to go off of the key number ahead of kickoff. Most books in Nevada are at 14 but the Golden Nugget stands at 13.5. Offshore the total dipped to 76.0 on Wednesday night and is a possible indication of where the market may head before Saturday night. __S&P+ prediction:__ Alabama 40, Oklahoma 33 __Note:__ S&P+ rankings are an advanced data set of tempo- and opponent-adjusted components of the five factors of college football: Efficiency, explosiveness, field position and finishing drives. Per creator Bill Connelly, a fifth factor, turnovers, is informed marginally by sack rates. __Play and win:__ [Join our free contests](https://betchicago.chalkline.com/) ## Alabama betting records, stats 2018 SU record: 13-0 2018 ATS record: 8-5 2018 O/U record: 8-4-1 S&P+ rank: 1 Off. S&P+ rank: 2 Def. S&P+ rank: 8 Special Teams S&P+ rank: 93 ## Oklahoma betting records, stats 2018 SU record: 12-1 2018 ATS record: 5-7-1 2018 O/U record: 11-2 S&P+ rank: 4 Off. S&P+ rank: 1 Def. S&P+ rank: 89 Special Teams S&P+ rank: 32 ## Notre Dame vs. Clemson Cotton Bowl betting trends Crimson Tide are 13-6 ATS in their last 19 games following a ATS loss. OVER is 13-3 in Sooners' last 16 games overall. Sooners are 1-3-1 ATS in their last five games overall and are 3-9 ATS in their last 12 neutral-site games.